Ghana made history at the maiden Afrofinns Achievement Awards held in Helsinki, Finland on 24th November, 2018. 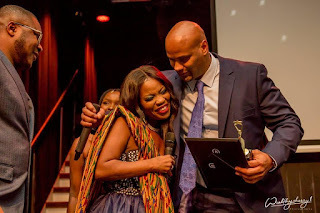 The event, organized by Afrofinns Ry and Think Africa aims to acknowledge, honor and celebrate Africans based in Finland and African immigrants in education, music, sports and other fields of entertainment. The inaugural ceremony held at Teatteri Forum had 13 categories with 40 nominees in total. Five Ghanaians who were nominated emerged winners in their various categories. Lukumanu Iddrisu picked the award for Academic Achievement category; Isaac Kumah emergedvictor in the Business/Project category; Blaqboy Jnr (Alfred Tetteh Coffie) formerly of Dr Cryme’s Twipop Record label grabbed the award for Afro Inspired Music; Nana TV (Nana Adjoa Boateng) grabbed the Media award whilst Nurudeen Adedorja walked away with the Sports Personality of the Year award. The Chairman of Afrofinns Ry, Elvis Fuamba in his welcome address emphasized that Africans are doing so well for themselves and Finland, but are never recognized and/or honored. Therefore, the ceremony is organized to appreciate and honor the achievements of the Afro-community as well as to use it as a platform to network and connect for African prosperity.The Ambassadors of Namibia and South Africa and other Finnish dignitaries were there to grace the occasion.